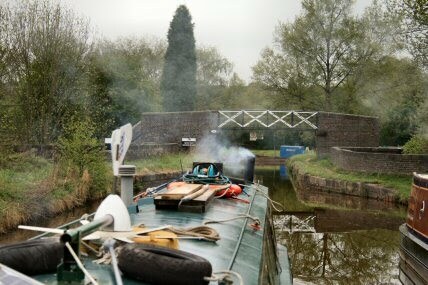 Leaving the mooring at Scholar Green for the end of the Macclesfield Canal. The first bridge I went under i found to my surprise a Smiley that someone had installed at the base. 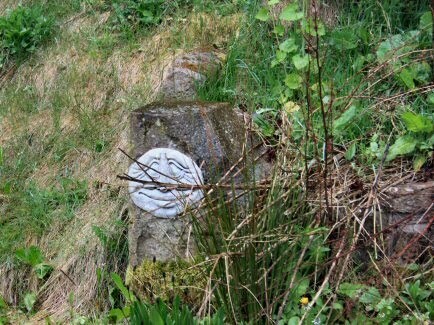 This is or was the end of the canal. 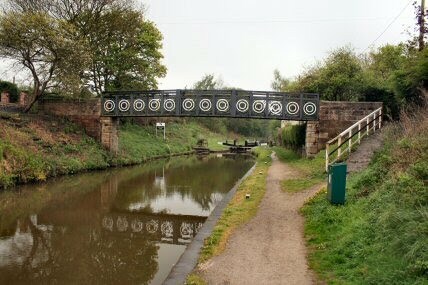 Nowadays the end of the canal is assumed to be at the junction. 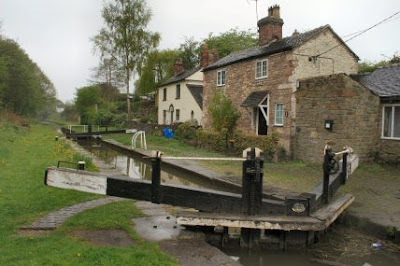 The stop lock has a drop of only about 12 inches but it is enough to ensure that should there be a breach then the one canal doesn't leak into the other. Both canals run parallel after the sharp left turn and crossing two aqueducts. The first is over a main road. 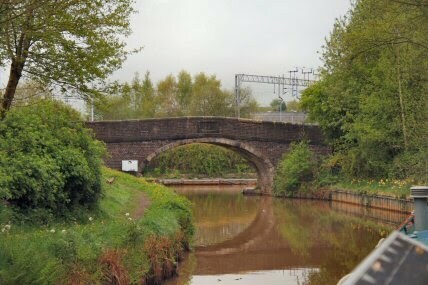 The second is over the canal that I will soon be joining at the junction. 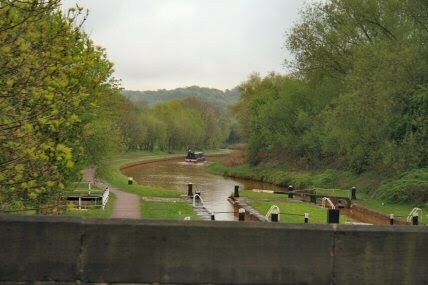 The Trent and Mersey still has a few locks to go to get us both on the same level. The junction. Its turn left for Chester and Llangollen and right for Nottingham and Coventry. 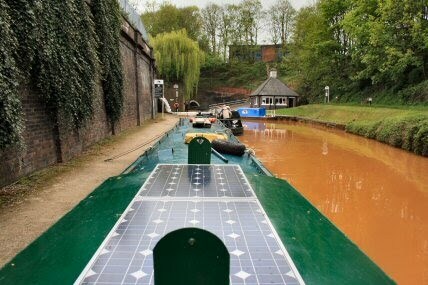 The colour of the canal is down to the amount of iron in it and not the amount of silt that is in suspension as on the Macclesfield. 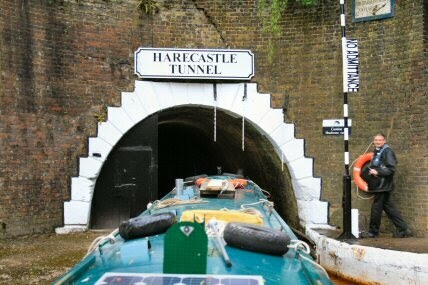 The Harecastle Tunnel. We were going to get some shopping done but didn't find a mooring so carried on and as soon as we arrived were told that we could go through in 10 to 15 minutes. Cleared the roof just in case. It wasn't that low but I did have to duck for a while in the middle. It takes about 45 minutes to get through. Towards the end there was this loud noise. Didn't know where it was coming from but hoped it wasnt me. It turned out to be ventilation fans. Just as I rounded the corner to enter the tunnel I managed to go aground but was soon off the silt and into the dark. The southern entrance. There were two tunnels here. One by Brindley and the other by Telford. 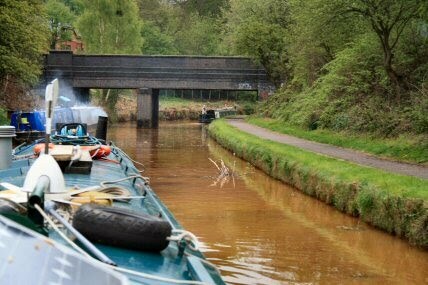 The Brindley tunnel closed due to subsidence from the mining underneath. According to legend, a young woman was decapitated in the Telford Tunnel in the 1800s, and her body thrown into Gilbert's Hole, a coal landing stage within the tunnel. It is believed that she now haunts Harecastle Tunnel, either in the form of a headless woman, or a white horse, and her appearance used to fore-warn of disaster in the local mines. Some boatmen took long detours to avoid the tunnel and today the tunnel keepers relate tales of occasional mismatches in the number of boats going in and coming out. Such tales are, however, fanciful, as any such discrepancy would result in a major search operation. 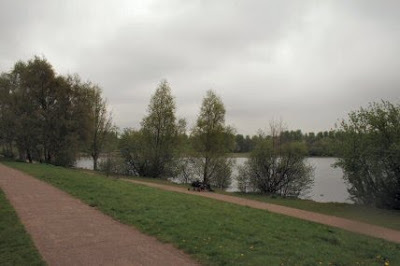 In fact there is no record of any such murder, and the story seems to have been inspired by the murder of Christina Collins in similar circumstances near Rugeley. The association with another canal ghost 'Kit Crewbucket', who haunts the Crick Tunnel, would also seem to be spurious. Out of the tunnel and soon find that I am back in civilisation. Gypos have an encampment near here and while a couple of the young ones waved and couple of the not quite so young were about to throw stones. Those Rochdale peasants will park their cars anywhere according to the Pennine Waterways blog. 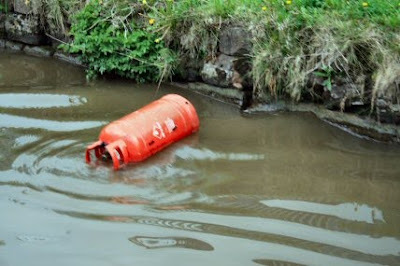 Boating on the western side of the Rochdale Canal has been disrupted by a car that has ended up in a lock. British Waterways reports that the car is in Lock 63, Walk Mill Lock, just north of Irk Aqueduct, Chadderton. The lock will remain closed pending a police investigation. BW wil issue an update tomorrow (6th May). If the lock number is correct then it is a puzzle how the car came to be there as it is a long way from the nearest road. 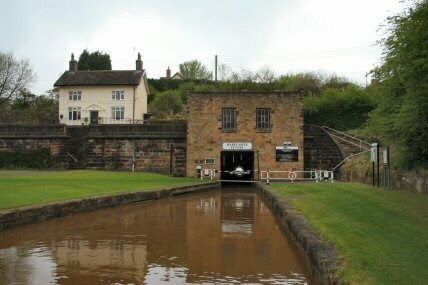 Boaters awaiting passage should moor up at the Irk Aqueduct moorings or above Slattocks Locks until BW announces that the lock has re-opened.